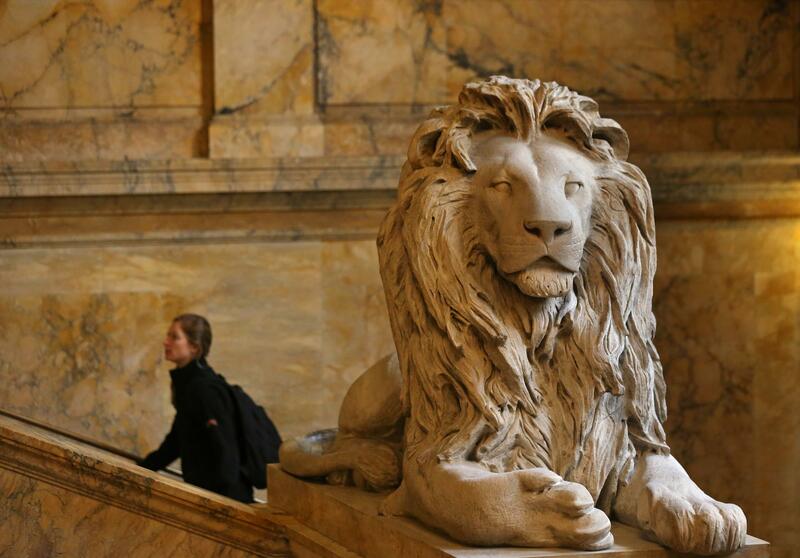 One of two lions on guard at the Boston Public Library in Copley Square. 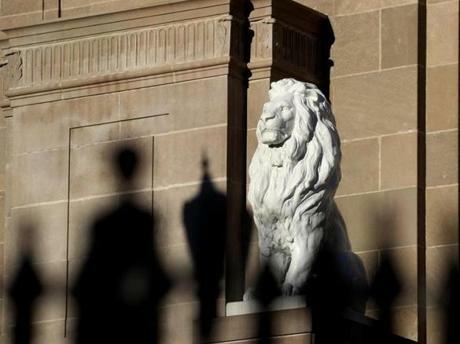 The lions are made from unpolished Siena marble by sculptor Louis Saint-Gaudens. They are memorials to the Second and Twentieth Massachusetts Civil War infantry regiments. The ancient Egyptians used lions in their art. So did the Mesopotamians and the Greeks. Islamic calligraphy often includes lions, as does the art of Southeast Asia — though lions were never even native to the region. Sometimes lions have stood for courage and strength; sometimes they have added a sense of majesty to buildings. Here in the United States, the National Zoo has two notable 5,000-pound brass lions flanking an entrance, and the Botanic Garden in Washington, D.C., features four bronze lions crouching on the American flag. Turns out, Boston is crawling with lions, too. In the North End, at the public library, in Chinatown, in Dorchester, at the MFA. Once you start looking for them, they seem to be everywhere. 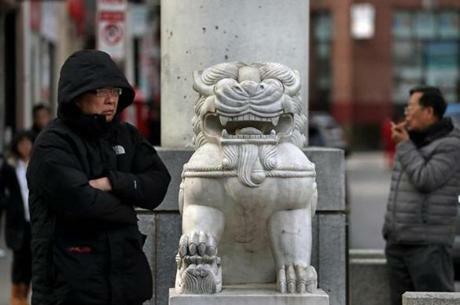 One of the marble Chinese Imperial Guardian lion sculptures at the Chinatown Gate in Boston, a gift from the Taiwanese government. Framed by a steel fence, this lion is on the facade of the United House of Prayer for All People on Seaver Street, Dorchester. The building was once a Jewish temple, Congregation Mishkan Tefila. 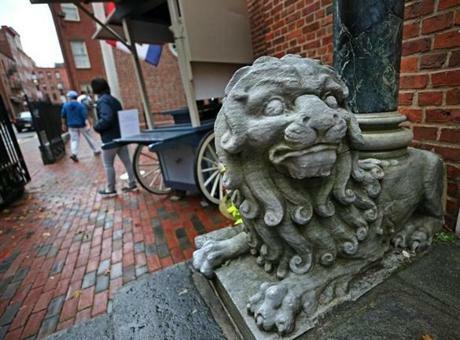 The golden lion statue on the Old State House is a replica of the 1713 original that was burned in a bonfire in 1776. In 2014, a time capsule from 1901 was found inside the statue when it was removed for restoration. A new time capsule was placed in the head. 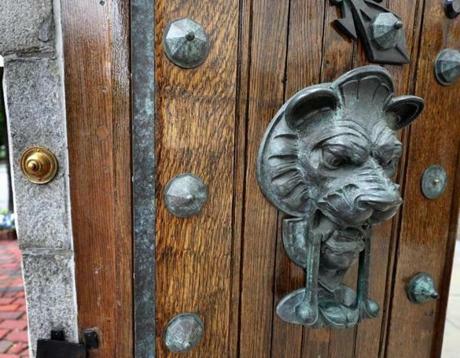 One of two lion doorknockers on the doors from the home of John Singleton Copley on Beacon Hill. 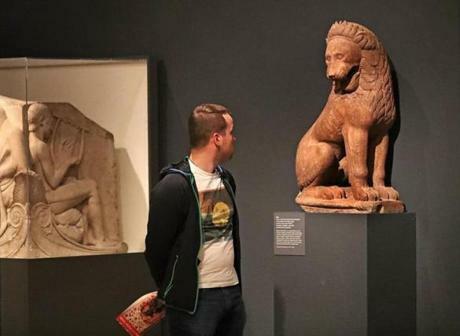 A lion sculpture from the Greek Archaic Period, about 550 B.C., on display at the Museum of Fine Arts Boston. It is believed to have been found at Perachora on the Isthmus of Corinth. A statue by the steps of the gift shop at Old North Church in the North End. 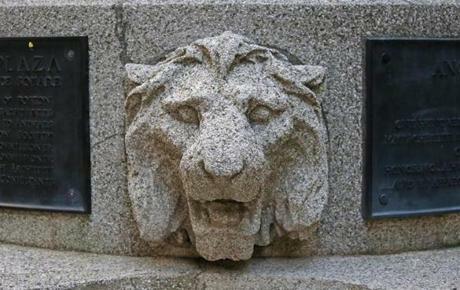 One of several lions in the Angell Memorial Park at Post Office Square, built in honor of the first president of the Massachusetts Society for the Prevention of Cruelty to Animals, George T. Angell. 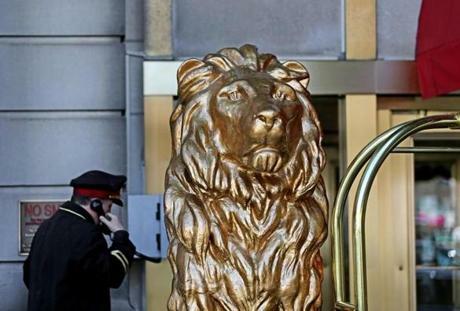 A doorman stood by one of the two gilded lions at the entrance to the Fairmont Copley Plaza Hotel. 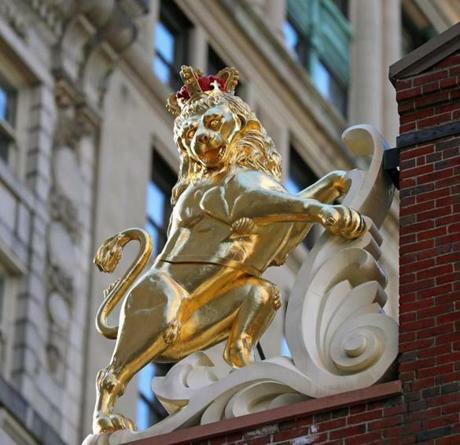 The lions, created by sculptor Alexander Pope, stood in front of the Hotel Kensington on Boylston Street until its demolition in 1967, later guarding the parking lot that replaced it until being purchased by the Copley Plaza in 1974. 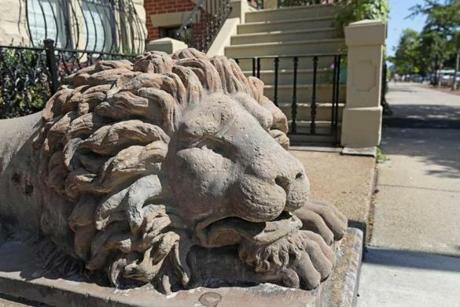 A marble lion lay next to the sidewalk at 511 Columbus Ave. The ornament was placed outside the residence then belonging to physician Dr. Orren S. Sanders around 1872.